"One of today's automatic buy-today-read-tonight series...thoughtful but suspenseful, fast but lasting, contemporary but strangely timeless." (Lee Child) In the extraordinary new Cork O'Connor thriller from New York Times bestselling and Edgar Award-winning author William Kent Krueger, the lives of hundreds of innocent people are at stake when Cork vanishes just days before his daughter's wedding. Since the violent deaths of his wife, father, and best friend all occurred in previous Novembers, Cork O'Connor has always considered it to be the cruelest of months. Yet, his daughter has chosen this dismal time of year in which to marry, and Cork is understandably uneasy. His concern comes to a head when a man camping in Minnesota's Boundary Waters Canoe Area Wilderness goes missing. As the official search ends with no recovery in sight, Cork is asked by the man's family to stay on the case. Although the wedding is fast approaching and the weather looks threatening, he accepts and returns to that vast wilderness on his own. As the sky darkens and the days pass, Cork's family anxiously awaits his return. Finally certain that something has gone terribly wrong, they fly by floatplane to the lake where the missing man was last seen. Locating Cork's campsite, they find no sign of their father. They do find blood, however. A lot of it. With an early winter storm on the horizon, it's a race against time as Cork's family struggles to uncover the mystery behind these disappearances. Little do they know, not only is Cork's life on the line, but so are the lives of hundreds of others. 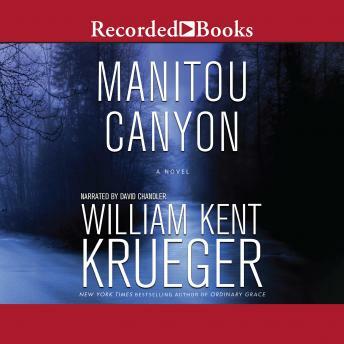 A taut, suspenseful thriller, Manitou Canyon features everything readers love in a Cork O'Connor novel: a dramatic Northwoods setting, an intriguing view of the Objibwe culture, an enigmatic crime, masterful storytelling, and more than a few surprises.